The C&F Design Fabre Entomology Kit is perfect for the fly-fisher who would like to know what the insects the fish are taking. 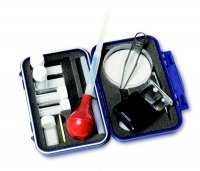 This superb compact entomology kit includes all of tools you want to examine the stomach contents of fish. Its ingenious stomach pump has mesh for keeping stomach contents in the tube because you will find them easily in the tube. A laboratory dish (scale marked in centimetres), Five small bottles, tweezer, loupe, five tags.